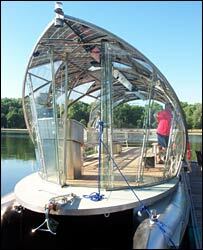 A shuttle boat powered entirely by the sun is to be launched on the Serpentine lake in London's Hyde Park. The 14.5m (48ft) Solarshuttle, thought to be the biggest of its kind in the UK, will carry 42 passengers between the north and south of the water. Cruising at 4mph, the boat - driven by two electric engines - is silent and pollution-free, say the makers. The Solarshuttle's launch comes amid a heatwave which has driven temperatures in London up to 32.7C (90.9F). When not in use and docked, any surplus electricity generated by the boat's solar panels will be fed back into the National Grid, they say. Designer Christoph Behling was also behind one of the world's largest solar boats, the Hamburg Solarshuttle, which now ferries passengers across the city's harbour. His latest design will ferry park visitors every half-hour between the boat house on the north side of the Serpentine and the jetty in the south, near the Princess of Wales memorial fountain. Mr Behling's family and friends will be aboard the Solarshuttle for its maiden voyage on Tuesday while members of the public will have to wait until Saturday for their turn.